Powermech Engineering offers complete range of Speed O Control Crane Control Gears including Electro hydraulic thrustors, Electro hydraulic thruster brakes, Eldro brakes, Flame proof brakes, Electromagnetic brakes, Master controllers, Mobile electrification systems, Limit swithces, Push button pendant stations, Festoon cable track system, etc. Master controller is housed in enclosed cover & provided with an easily removable cover with ample area for maintenance. The cam shaft is mounted on bearing bushes on walls of housing. The cams are made of delrin material and fixed on a square spindle switch moved by a handle. The cams are cut corresponding to the switching program. 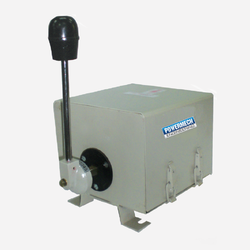 Application: Hoist Grab, Mill Duty, E.O.T. Cranes & Rolling mill drives. Looking for Master Controller ?